BE YOU | Create. Grow. Encourage. Heal. I was at the end, or rather, struggling with the end of a relationship. 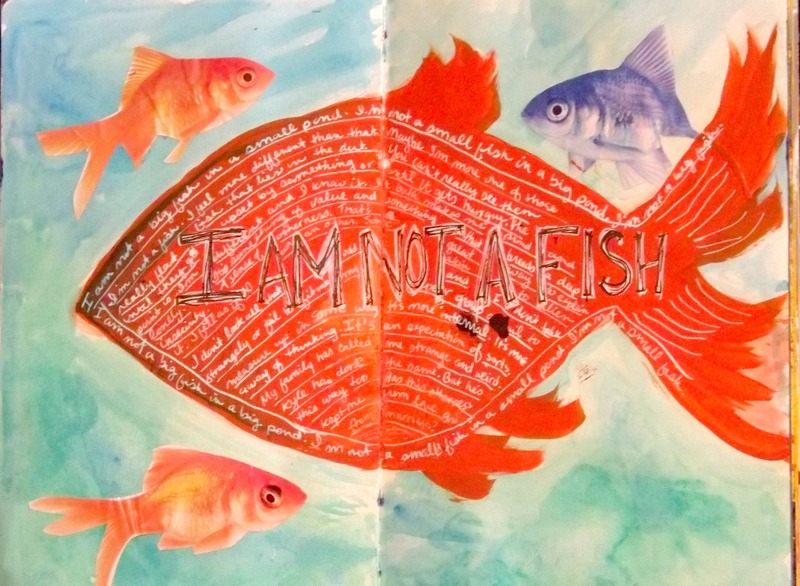 And of course, with the end of a relationship those around you say, “There are other fish in the sea.” When I wrote this I was recognizing my differences with the people around me. It’s not a feeling of rebellion or dissatisfaction with who I am. It is just recognizing and honoring my uniqueness. I like me. Do you like you? What do you like about you? What makes you unique? What mold did you break? Watercolor Background is very watery watercolor application. The background was applied around the large fish. Acrylic The fish is orange acrylic. I often mix my own colors. I buy primary colors of high quality acrylic and mix what suits my mood. Collage Small fish around the large fish are magazine images. Journaling India ink. I love my dip pens. NOTE: If you look in the middle of this spread you will see two large black spots. I didn’t mean for that to happen. But it did and I just kept going. I like this page. It’s one of my favorites. Don’t let incidents like that stop you. I often define creativity as the ability to make a mistake look like you did it on purpose.